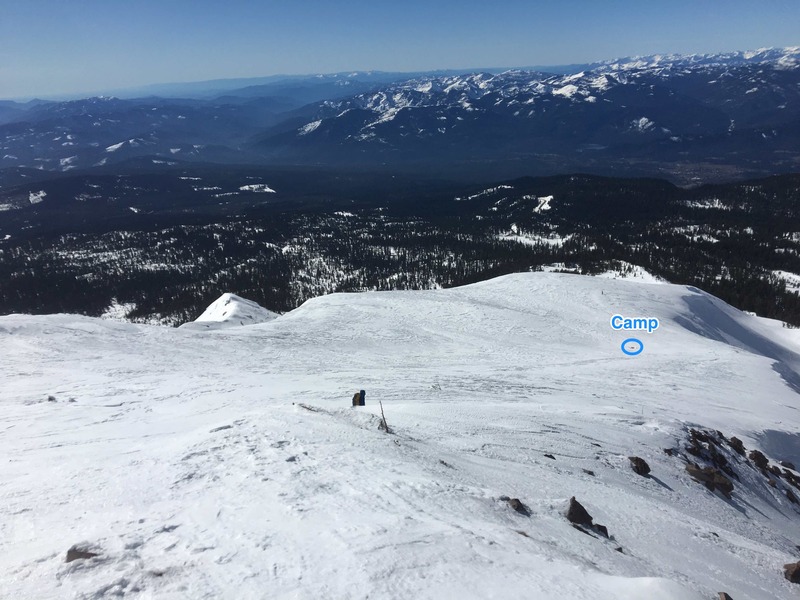 On February 5, 2016 I went up to Mt. Shasta City with my friend Michele to attend a free avalanche training from the Mt. 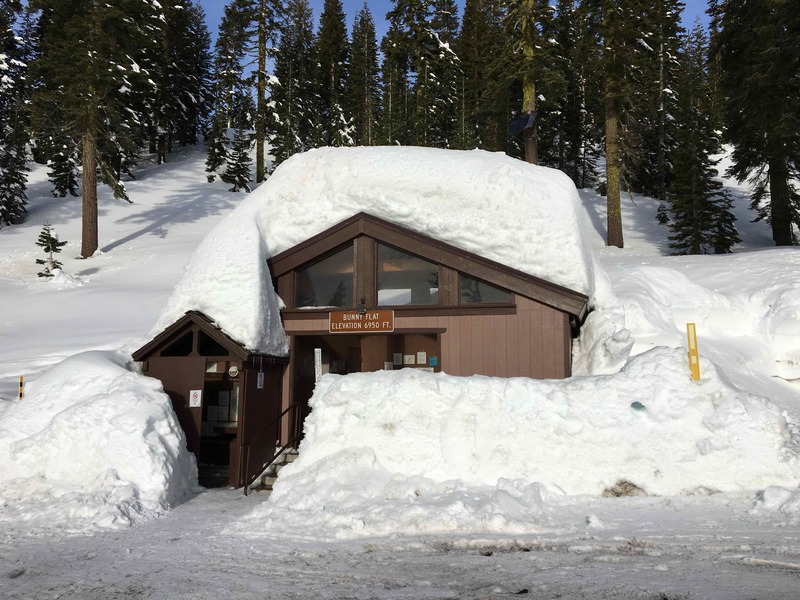 Shasta Avalanche Center. 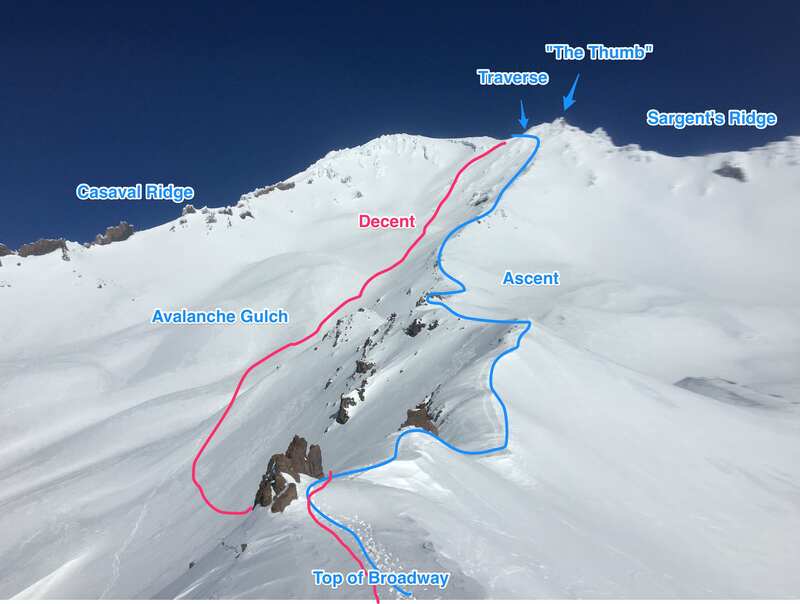 Once we saw that low avalanche danger, clear skies and light wind was predicted for the whole weekend we decided to do a summit attempt Sunday morning up the Green Butte route (map 1, map 2, map 3). Spending Saturday night on the mountain somewhere around Green Butte. The road up to the Bunny Flat trailhead was plowed and clear. Any snow on the road had been melted out. 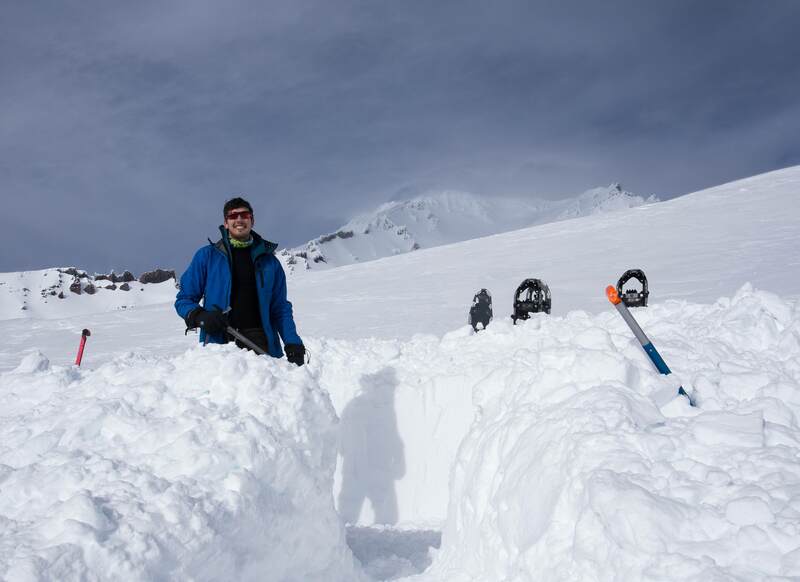 Once we arrived to the trailhead itself the snow had become 8-9 feet deep on either side of the road. We filled out our permits and threw out our tent off trail by 100m so not to be woken by other climbers arriving late or moving up the mountain early. We were sleeping around 10 pm. The next morning we went into town for breakfast and rented mountaineering boots / crampons prior to the morning beacon training. Back at Bunny Flat we received instruction from the head climbing ranger on Shasta. 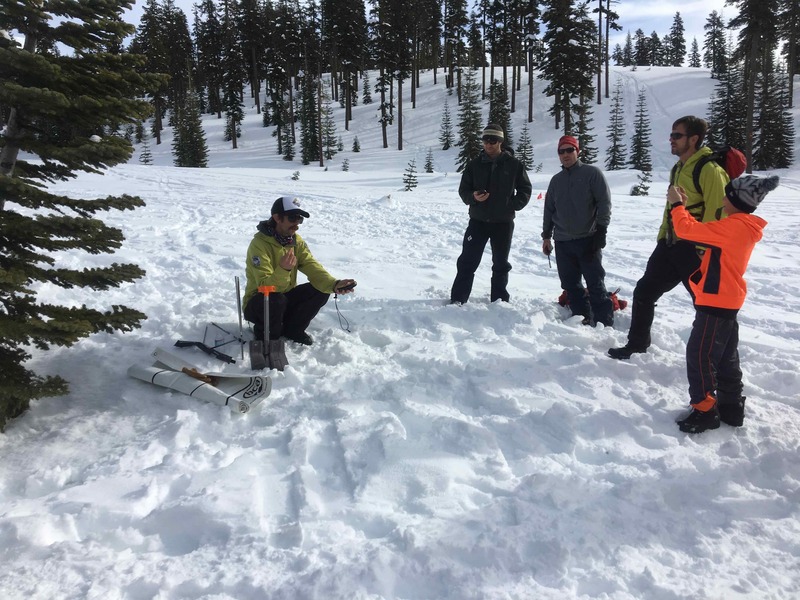 Next we practiced beacon/probe usage on a course they had set up with buried beacons and packs. By 11:30am we thanked the rangers, said farewell and headed up to Broadway with snowshoes on our feet and packs on our backs. After a four hour hike we arrived on the last gentle grade of Broadway and decided to dig in halfway up the slope in a divot that might be more protected from wind. While people often camp at Green Butte directly or on the top of Broadway, we were also told these areas were hammered by wind so chose a lower spot since avalanche risk was so low. After a good hour of digging steep snow walls we ate dinner and attempted to start sleeping at 6:30pm. However, we couldn’t get our tent guylines tight enough inside our shelter and the wind rattled the walls all night. Overnight wind swept snow buried some of our gear and we had to dig out a little when we awoke for our alpine ascent at 2am. Beginning our ascent from Broadway. Michele in front and the ridge dropping off to the right. 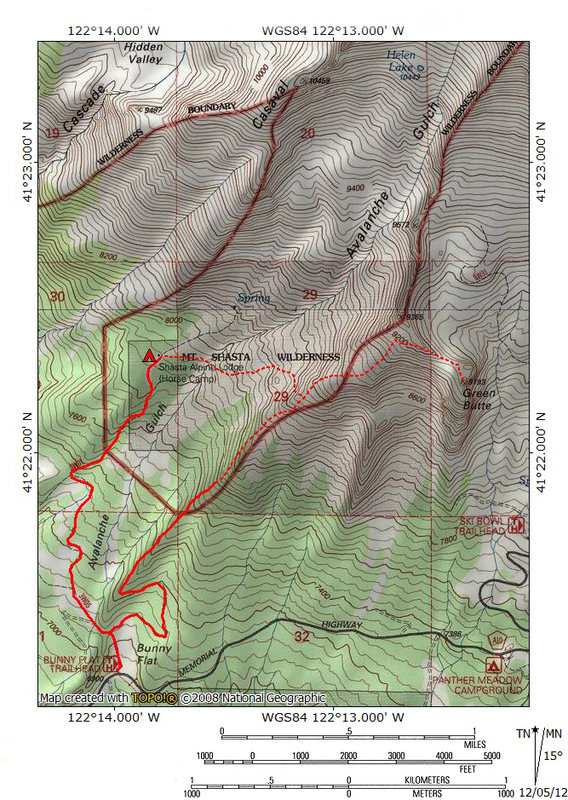 By 2:45am we were fed, with crampons on heading up the Green Butte route. 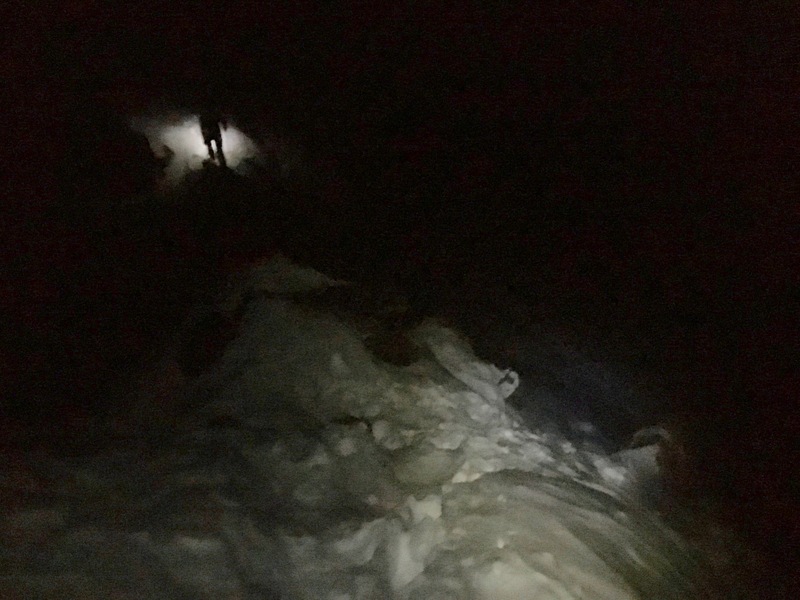 It was completely dark due to a new moon so we needed our headlamps consistently to find the route and assess obstacles and risks. At the top of Broadway the ridge has only a light incline, but falls off on either side making this part of the route very fun. 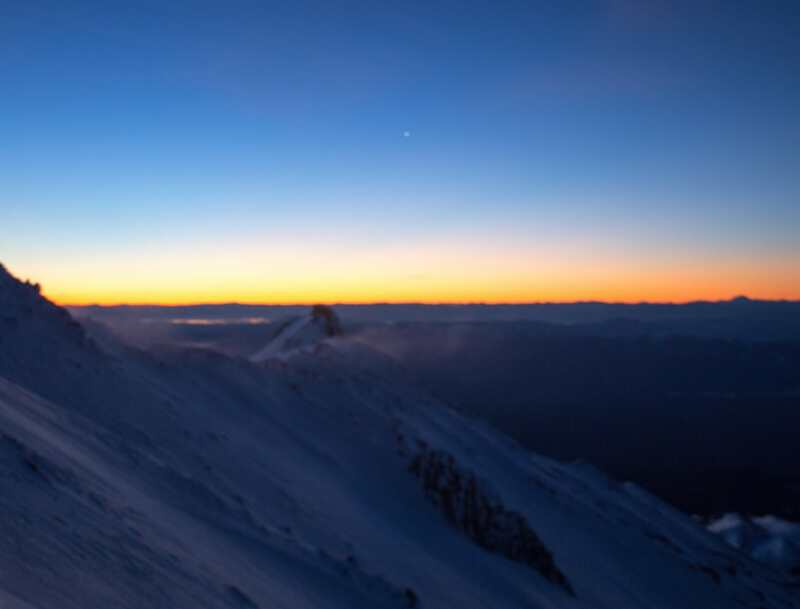 While this part of the route was my favorite, it also was a little nerve racking since this was my first time ascending a Grade II ridge route on Shasta in complete darkness. Being very comfortable with self arrest and self belay was helpful to keep me calm and enjoying the situation. Looking at our post holes from the morning upon returning to Broadway. The snow varied from firm / icy to an icy crust yielding powder. Regardless of the surface it was not possible to judge which was the case and resulted in over half my steps becoming post holes this route. Typically just a half foot, but some times up to my waist. Often I had to pull myself out using self belay and work my way up the slope using my free hand as another contact point by punching into the snow or placing it on the crust. Additionally I would lean into the slope and spreading my weight partially on my knees. The technique especially later at altitude was very tiresome. After an hour or two we got to the base of the big increase in slope. Then around 6am the wind picked up and started blowing consistently, stinging our eyes and face with snow grains when looking up route. Michele led most of the route so I often followed in his foot steps, sometimes falling through to a deep post hole because I am heavier. However, I couldn’t be complacent and had to consistently pan the route left to right looking for the ridge edge, cornices, rocks below, etc. using my headlamp to illuminate the new moon darkness. The upwards slopes on the traverse looked like they might pose avalanche risk under other conditions, but again our risk was low on this day. We did gain a new challenge though. The Northern wind would knock frozen ice pieces down towards us from the ice crusted snow and gusts would force us to catch ourselves if hit by the wind while out-of-balance. Luckily we now had enough light to put on my sunglasses for protection from windward debris. Often the ice kicked down was the size of pebbles and would sting my skin. However, one time I had to dodge a couple pieces the size of two fists. It was 10am upon reaching Red Banks which means we had been climbing for around seven hours. I found my breathing in a similar cadence as at Misery Hill when I summited the West Face last year. This was surprising because Misery Hill was 500-700 ft higher, but the higher exertion of every step in the soft snow made up for the elevation. 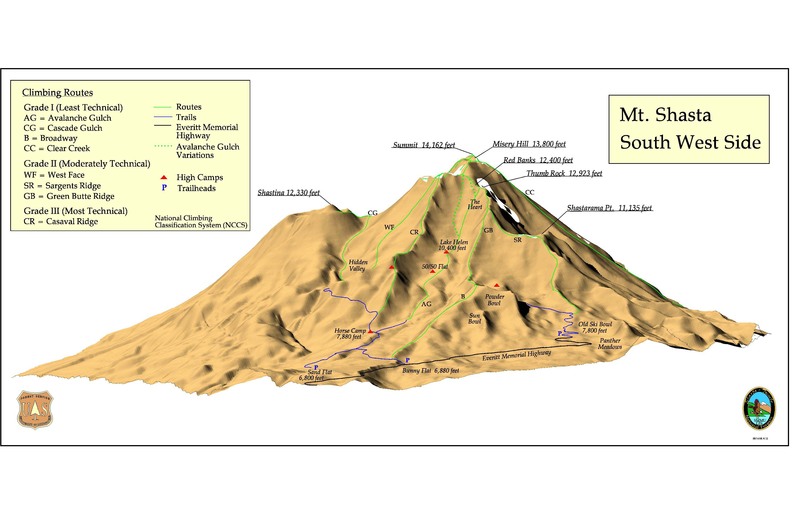 Both Michele and I knew we could make the summit, but the added time would likely put us arriving back in the SF Bay Area at midnight or later so we decided to call it good completing the Green Butte route and glissade down. Glissading down Avalanche Gulch further showed how uneven the snow was with conditions ranging from firm ice-like segments followed by powder pockets several feet later. After a quick decent we were at the base of Broadway and had the pleasure of climbing up the several hundred feet to its top to pack up our camp and hike out. Trying to kick step in wet, warm snow wasn’t that fun, but we made it to the top shortly. After quickly digging out our stakes and packing up we were moving down the mountain in short order. Reaching Bunny Flat at 1:30pm after a quick 1:15 hrs decent from Broadway. On the way down I was again glad to have my snow shoes to avoid post holing down the ridge line. 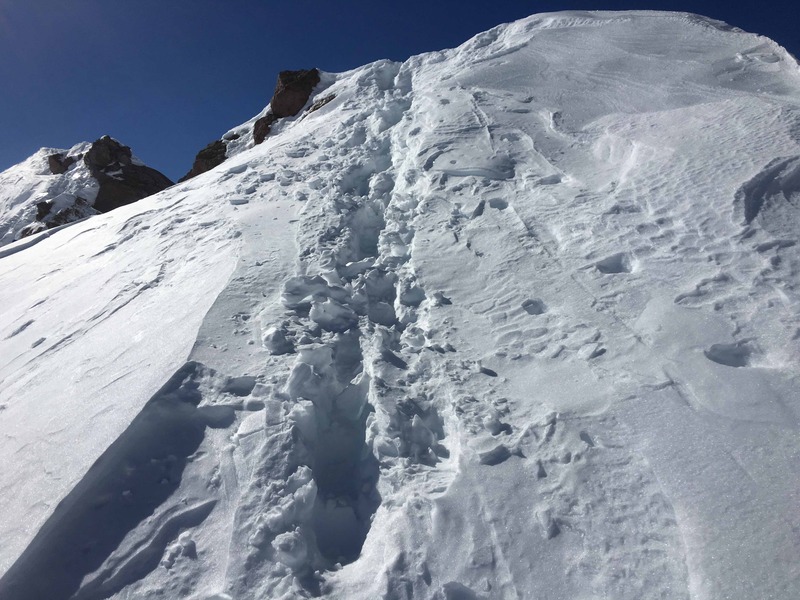 In retrospect, the biggest thing I learned from this trip is how tiresome winter mountaineering can be if the thaw-freeze cycle hasn’t produced the firm corn snow we experienced last Spring on the West Face.